Mouse anti poly (ADP-ribose) polymerase 1 antibody, clone A6.4.12 used to immunolocalize PARP-1 expression in normal and Alzheimer's diseased brain by immunohistochemistry on formalin fixed paraffin embedded tissue sections. Nucleolar PARP-1 immunoreactivity in AD ranged from absent to dispersed and less intense compared to that of controls. 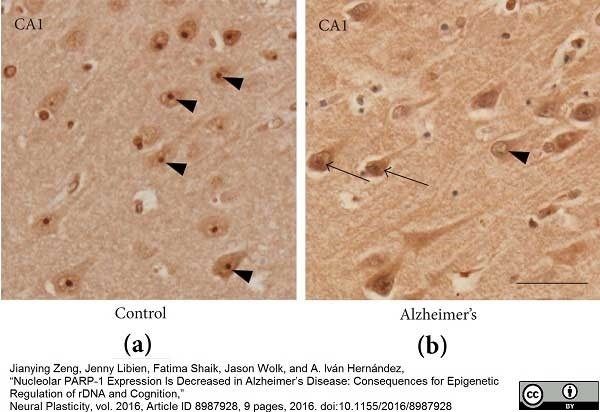 ((a) and (b)) Representative immunostaining with diaminobenzidine (DAB) of human hippocampal pyramidal neurons in CA1 region. (a) Prominent nucleolar staining of PARP-1 (arrows) was seen in most of pyramidal neurons of a control case. (b) The nucleolar staining of PARP-1 ranged from absent (arrowheads) to a more dispersed pattern with less intensity of label (arrows) in pyramidal neurons of an AD case. Neural Plasticity, vol. 2016, Article ID 8987928. Mouse anti poly (ADP-ribose) polymerase 1 antibody, clone A6.4.12 used to immunolocalize PARP-1 expression in normal and Alzheimer's diseased brain by immunofluorescence on formalin fixed paraffin embedded tissue sections. PARP-1 nucleolar immunoreactivity is altered in hippocampal pyramidal cells in AD brains. Representative confocal microscopy of PARP-1 immunostaining (red) with DAPI nuclear counterstaining (blue) of CA4 hippocampal pyramidal neurons. 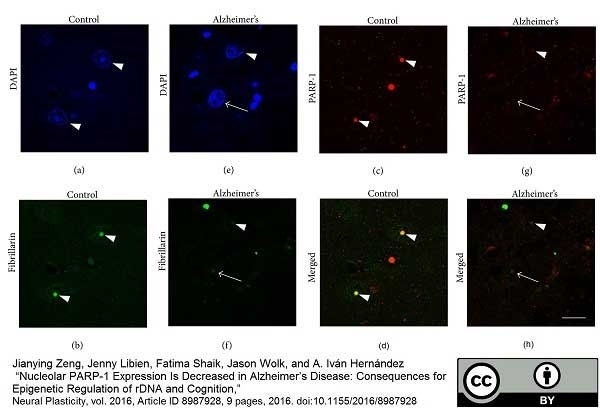 In controls brains (a–c) a high percentage of pyramidal cell nucleoli have intense and well- delineated PARP-1 staining (arrowheads). In contrast, in AD brains (d–f), the percentage of intensely stained and well-delineated nucleoli is less than in the controls and there is a more dispersed pattern with weak label intensity ((d) and (f), arrow). ((g) and (h)) The percentage of CA1 (g) and CA4 (h) hippocampal pyramidal neurons with PARP-1 positive nucleoli staining was less in AD cases compared to controls. (Control, and for CA1 and CA4, resp. ; AD, for both CA1 and CA4; .) Scale bar = 25 μM. Nucleolar proteins in hippocampal pyramidal cells are altered in AD. ((a)–(h)) Representative figures show colocalization ((d) and (h), yellow) of fibrillarin ((b) and (f), green) and PARP-1 ((c) and (g), red) in the nucleoli of pyramidal neurons. Control cases exhibit high intensity staining (a–d) compared to AD (e–h) (arrowheads). In AD compared to controls, there is a lower percentage of nucleoli that are both PARP-1(+) and fibrillarin(+) ((f)-(g), arrowhead) in CA1 (see Table 2) and CA4 (see Table 3) pyramidal cells and a higher percentage of nucleoli PARP-1(−)/fibrillarin(+) ((f) and (g), arrow) in CA1 (see Table 2) and CA4 (see Table 3), suggesting that different nucleolar proteins are affected in different ways in AD. Scale bar = 20 μm. Mouse anti poly(ADP-ribose) polymerase-1 antibody, clone A6.4.12 (MCA1522G) used for the evaluation of PARP-1 expression in murine neural stem/progenitor cell populations by western blotting. 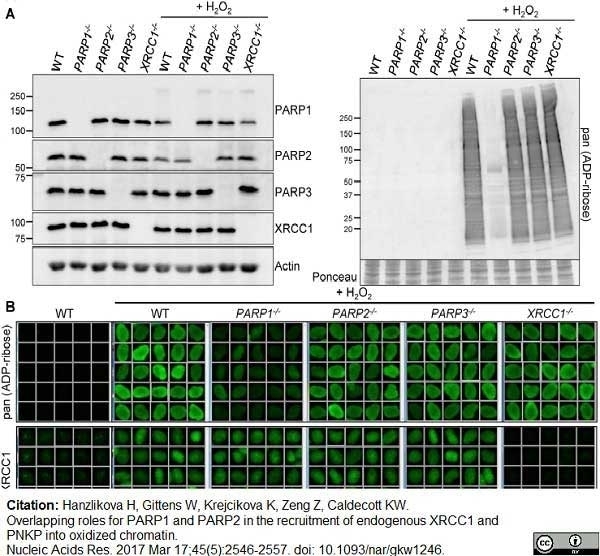 Higher amounts of p53 protein and phosphorylated p53 in NSPCs after PARP inhibition. a Cleaved fragments of caspase-3 (p17) and caspase-8 (p43/p41/p18) were clearly detectable by western blotting with specific antibodies. The cleaved fragment of pro-caspase-9 (p37) was also detectable, although the band density of this fragment was low. b Phase-contrast images were shown on the top. 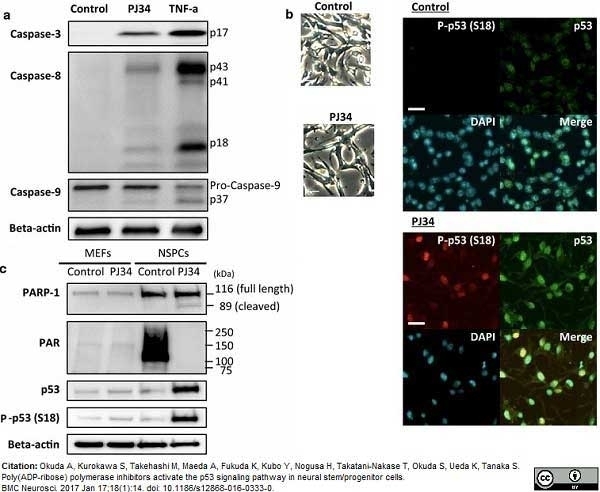 Higher amounts of p53 protein and phosphorylated p53 in NSPCs after PARP inhibition were also revealed by immunocytochemistry. Representative images from 4 separate experiments are shown. c Western blot analysis demonstrated that PARP-1 was abundant and activated in NSPCs in contrast to MEFs. Amounts of p53 protein and phosphorylated p53 at Ser 18 were remarkably increased by PJ34. Scale bars in (b), 20μm. From: Okuda A, Kurokawa S, Takehashi M, Maeda A, Fukuda K, Kubo Y, Nogusa H, Takatani-Nakase T, Okuda S, Ueda K, Tanaka S.
BMC Neurosci. 2017 Jan 17;18(1):14. Mouse anti Human PARP-1 antibody, clone A6.4.12 (MCA1522G) used for the evaluation of PAR-1 expression on wild type and knockout hTERT immortalized retinal pigment epithelial cels by westrn blotting and immunofluorescence. Development of PARP1-/-, PARP2-/-, PARP3-/- and XRCC1-/- RPE-1 cells and XRCC1 high-content imaging. Wild type (WT), PARP1-/-, PARP2-/-, PARP3-/- and XRCC1-/- RPE-1 clonal cell lines were analysed for loss of the targeted protein by (A) Western blotting and (B) immunofluorescence. Note that the PARP3 antibody available to us was not suitable for immunofluorescence. From: Hanzlikova H, Gittens W, Krejcikova K, Zeng Z, Caldecott KW. 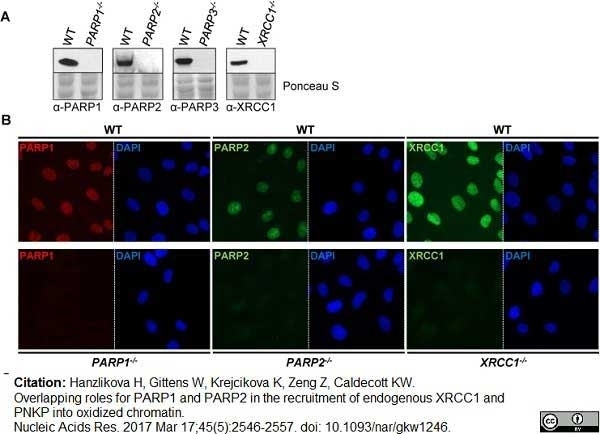 Overlapping rolesfor PARP1 and PARP2 in the recruitment of endogenous XRCC1 and PNKP into oxidized chromatin. Nucleic Acids Res. 2017 Mar 17;45(5):2546-2557. Mouse anti Human PARP-1 antibody, clone A6.4.12 (MCA1522G) used for the evaluation of PAR-1 expression on wild type and knockout hTERT immortalized retinal pigment epithelial cells by western blotting. Levels of H2O2-induced ADP-ribosylation and XRCC1 recruitment into chromatin in PARP-deleted RPE-1 cells. (A) Levels of the indicated proteins (left) and ADP-ribosylated proteins (right) were compared in cell lysates from the indicated WT or mutant RPE-1 cells harvested before and after treatment with 400 μM H2O2 for 7 min by Western blotting using appropriate antibodies and anti-pan-ADP-ribose binding reagent. (B) Levels of ADP-ribosylation and chromatin-bound XRCC1 were analysed by indirect immunofluorescence in cells treated or not with H2O2 (as above) by fixation and staining with anti-pan-ADP-ribose binding reagent (top panels) or by detergent pre-extraction prior to fixation and staining with anti-XRCC1 antibody (bottom panels). Representative ScanR images are shown. Mouse anti poly (ADP-ribose) polymerase 1 antibody, clone A6.4.12 recognizes poly (ADP-ribose) polymerase 1 (PARP-1), a ~116kD nuclear enzyme cleaved during apoptosis (Soldani et al. 2002). PARP-1, a caretaker enzyme, is involved in DNA damage repair (Langelier et al. 2013), plays roles in diabetes pathophysiology (Andreone et al. 2012) and tumour proliferation (Rosado et al 2013.). As well as protecting cells from genomic instability, PARP-1 is involved in the development of both inflammatory and immune responses, and cell death by apoptosis and necrosis (Erdélyi et al. 2005). Mouse anti poly(ADP-ribose) polymerase 1 antibody, clone A6.4.12, targets PARP-1, an enzyme which represents a promising target for new developments in therapeutic treatment of immune mediated diseases (Rosado et al. 2013). PARP-1 has considerable potential for delivering selective tumour cell killing while sparing normal cells (Pinton et al. 2013). Spleen cells from immunized BALB/c mice were fused with cells of mouse NS0 myeloma cell line. 1 Clone A6.4.12 requires antigen retrieval using heat treatment prior to staining of paraffin sections. Sodium citrate buffer pH 6.0 is recommended for this purpose. Harris, J.L. et al. (2009) Aprataxin, poly-ADP ribose polymerase 1 (PARP-1) and apurinic endonuclease 1 (APE1) function together to protect the genome against oxidative damage. Hum Mol Genet. 18: 4102-17. Freire, R. et al. (2001) Cleavage of the Bloom's syndrome gene product during apoptosis by caspase-3 results in an impaired interaction with topoisomerase IIIalpha. Nucleic Acids Res. 29 (15): 3172-80. Krohn, A.J. et al. (1998) Staurosporine-induced apoptosis of cultured rat hippocampal neurons involves caspase-1-like proteases as upstream initiators and increased production of superoxide as a main downstream effector. J Neurosci. 18 (20): 8186-97. Staples, C.J. et al. (2010) Cross-talk between the p38alpha and JNK MAPK pathways mediated by MAP kinase phosphatase-1 determines cellular sensitivity to UV radiation. J Biol Chem. 285 (34): 25928-40. Alexander, B.M. et al. (2010) DNA repair protein biomarkers associated with time to recurrence in triple-negative breast cancer. Clin Cancer Res. 16: 5796-804. Gueven, N. et al. (2004) Aprataxin, a novel protein that protects against genotoxic stress. Hum Mol Genet. 13 (10): 1081-93. Gueven, N. et al. (2006) Defective p53 response and apoptosis associated with an ataxia-telangiectasia-like phenotype. Kim, J.W. et al. (2000) Inhibition of homodimerization of poly(ADP-ribose) polymerase by its C-terminal cleavage products produced during apoptosis. J Biol Chem. 275: 8121-5. J Biol Chem. 285: 25928-40. Olaussen, K.A. et al. 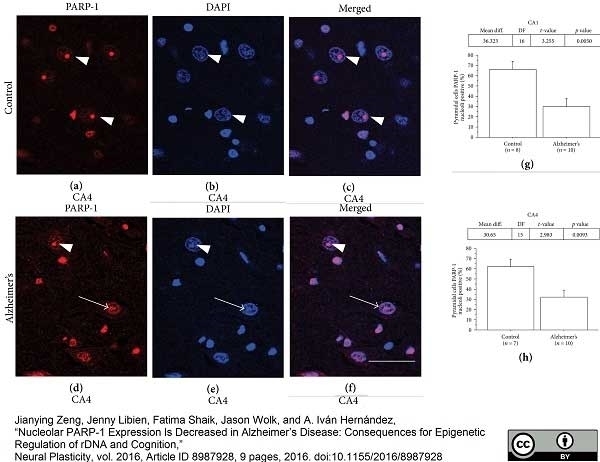 (2013) PARP1 impact on DNA repair of platinum adducts: Preclinical and clinical read-outs. Fabrice, A. et al. (2012) PARP and adjuvant cisplatin-based chemotherapy in non-small-cell lung cancer. Geistrikh, I. et al. (2011) Ca2+-induced PARP-1 activation and ANF expression are coupled events in cardiomyocytes. Mirzaa, G.M. et al. (2014) Mutations in CENPE define a novel kinetochore-centromeric mechanism for microcephalic primordial dwarfism. Milner, R. et al. (2013) Validation of the BRCA1 antibody MS110 and the utility of BRCA1 as a patient selection biomarker in immunohistochemical analysis of breast and ovarian tumours. Inbar, D. et al. (2012) Erythropoietin-driven signalling and cell migration mediated by polyADP-ribosylation. Br J Cancer. 107: 1317-26. Buchsbaum, S. et al. (2012) FAT10 is a proteasomal degradation signal that is itself regulated by ubiquitination. Mol Biol Cell. 23: 225-32. Mullane, S.A. et al. (2015) Expression Levels of DNA Damage Repair Proteins Are Associated With Overall Survival in Platinum-Treated Advanced Urothelial Carcinoma. Clin Genitourin Cancer. pii: S1558-7673(15)00359-6. Okuda, A. et al. (2017) Poly(ADP-ribose) polymerase inhibitors activate the p53 signaling pathway in neural stem/progenitor cells. BMC Neurosci. 18 (1): 14. Hanzlikova, H. et al. (2017) Overlapping roles for PARP1 and PARP2 in the recruitment of endogenous XRCC1 and PNKP into oxidized chromatin. Nucleic Acids Res. 45 (5): 2546-2557. Pinton, G. et al. (2013) PARP1 inhibition affects pleural mesothelioma cell viability and uncouples AKT/mTOR axis via SIRT1. J Cell Mol Med. 17: 233-41. Rosado, M. et al. (2013) Beyond dna repair,the immunological role of parp-1 and its siblings. Andreone, T. et al. (2012) Cytokine-mediatedβ-cell damage in PARP-1-deficient islets. Am J Physiol Endocrinol Metab. 303: E172-9. Langelier, M.F. and Pascal, J.M. (2013) PARP-1 mechanism for coupling DNA damage detection to poly(ADP-ribose) synthesis. Curr Opin Struct Biol. 23: 134-43.